The Excel UserForms for Data Entry ebook kit will take you through the steps to build a UserForm that stores data on a hidden worksheet. You don't need to be an experienced programmer -- everything is explained in simple steps, with written instructions, screen shots, videos and workbooks. There is also a bonus add-in -- UserForm Builder -- that quickly creates a UserForm for you. Bonus - UserForm Builder add-in - automatically creates a UserForm! This kit is for Excel 2007 or later . is formatted in a generous sized 13 pt font, so it's easy to read. has a table of contents with bookmarks, for easy navigation. a completed workbook, so you can see how the UserForm works, before you begin building it. 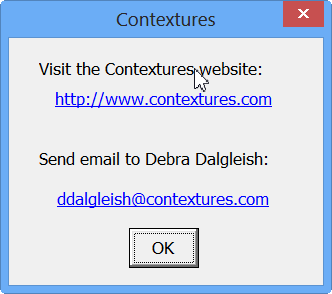 a starting file, so that you can skip the preliminary steps, if you wish to, and get right to the UserForm construction. The course has 2 step by step projects, and you can see a demo of project 2 in the video below. Use this tool to make a simple UserForm for data entry, based on a table in your workbook. This short video shows you how quick and easy it is -- much faster than building from scratch! There are 5 bonus files in the UserForm kit. These do not include step by step instructions, but there is a User Guide that outlines the key settings in each form, and a demo video that shows how each form works. Also, you can examine the code to see how the advanced techniques work. Select a time slot and assign players to that time. You could adapt this concept to other uses, such as shift assignments. This sample has a time slot combo box, and only the available times are shown. In the player drop downs, only the unassigned players are listed. 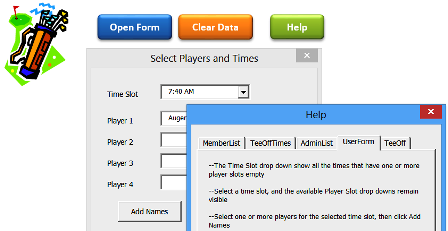 If you select a time slot with fewer than 4 player slots available, only the available player slots are shown. Click the Help button, on a worksheet or in the UserForm, to open the Help UserForm at the applicable tab in the multi-tab control. 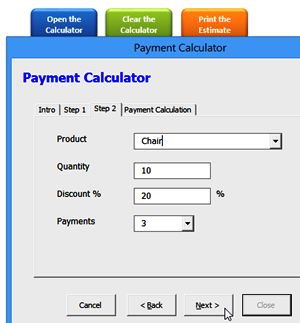 Enter customer information, select a product, discount, and payment plan. 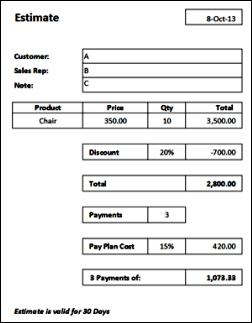 Cost calculations are done on a hidden sheet, and nicely formatted version of the Estimate can be printed. Click Back and Next buttons to move through the tabs. Labels on the form are set up as hyperlinks. Enter the correct password, and the "Show Sheets" macro runs. Characters are disguised when entered in the password text box. Password must match correctly, or the macro does not run. Enter criteria in one or more of the search boxes, then see a list of matching records. Select a record and update or delete it, or add a new record. Watch this short video, to see how the UserForm works. 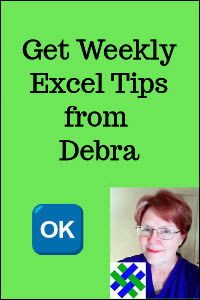 Click the Add to Cart button, to get the Excel UserForms for Data Entry eBook and Excel files. Step by step purchase instructions are listed below. Your download will be available for 48 hours, or 5 downloads, whichever comes first. The Excel UserForms for Data Entry licence is for a single (1) user. You may use the downloaded material for personal or business use, but may not resell or repackage the contents. After you purchase the Excel UserForms for Data Entry material, you may return it for any reason, within 30 days. Your purchase amount will be fully refunded.